Due to its location, the area of Tsakonia embrace Christianity in a later time. The expression "Are you a Christian or a Tsakonas" strongly depicts this delay, compared to the residents of neighboring areas. 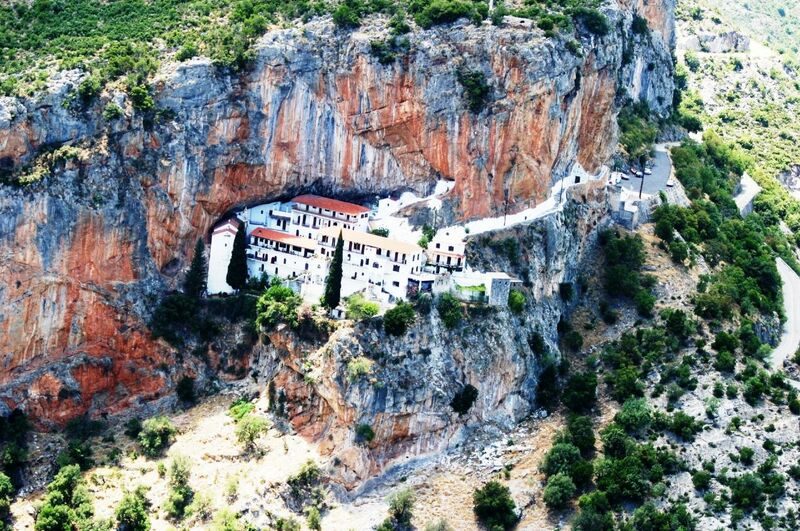 However, today Parnonas is filled with monasteries and also called the "Holy Mountain" of southern Greece. A monastery very important and renowned, dedicated to the Virgin Mary, built in 15th-16th century, in a recess of a vertical cliff above the canyon Dafnona, seemed like she was hanging to chaos, located only 17 km from Leonidio, the capital of the municipality. When you see it from the bottom of the road tern as you pass the ravine you are amazed by it’s the glory and its sanctity. The image of the Virgin is miraculous. It is a creation of the evangelist Luke, one of the 70 images has devoted her, is made from beeswax and mastic. The monastery is a jurisdiction of the Patriarchate, hosts many relics of Saints and Gospels, Holy Relics and specials in honor of the many miracles she has done. The temple is wooden and wonderful, the catholic has been built in 1812, when Veli Pasha commanded. The history and the holiness of the monastery are very great. The monks who founded were killed by the Turks and the monastery have been sacked and burned several times during the Ottoman era, had a great part and contribute in the Revolution of 1821.Today is a female monastery celebrates on 15 August and 21 November. The icon of St. Nicholas represents his Dormition and its rare hagiography, makes it special. Rare manuscripts of the Gospels which adorned with delicate decorations, but also other relics are found among the treasures held. Worth mentioning is that among these treasures, there is one piece of the spine which at the Tradition, belonged to a very large snake "Dragon" who lived in the area, but scientific research has shown that it is a human invention. The monastery celebrates on December 6 and on May 8, but on 8 of September and on 3 of October honors as well as Saint Dionysius. Near the monastery there are many caves, and one of them is considered the "Cave of Inos" or else the "Caveof Dionysus." Another monastery in jurisdiction of the Patriarchate, it was built by monks of the Monastery of Karyon of Mount Athos at an altitude of 600 meters, one hour way from the castle of Orion. Mentioned its existence in 1621 in Ottoman documents. It is cruciform with a dome and the dome is dodecagon. The painting was made by George and Demetrios Mosko in 1638. The temple is a masterpiece and by walnut wood. It is dedicated to St. Nicolas and the image of the Holy is a work of 1600 and has been altered due to the cult of worshipers. Admirable is the floor of the church, which is executed with a layman way, forms of lion, bull, the double-headed eagle and a winged demon. An hagiography which pictures saints who ride their horses adorn the temple. According to the tradition, during the Turkish occupation the monastery was burned, but the faces of saints remained intact due to the styles of the floor, who acted as guards and protect them. Celebrated on December 6 and 8 May. Many are the chapels surrounding the beautiful valley of Leonidion or the "Garden of Dionysus" as called by Pausanias in antiquity. The most famous ones are the Our Lady of Chatzalious , Prophet Elijah, St. Leonidas and Agios Athanasios. From there visitors can gaze at the fertile plain of Leonidio featuring orange and olive groves. On some days when the breeze is light you can also see Spetses.